I would like a more powerful scooter but they are just too heavy to put on the back of the van. The little vision is just so much fun though and whilst it will crawl up a big pass it will get to the top eventually. I just keep expecting it to burst with the effort but it keeps going and so far has not let us down. One day in the Pyrenees we did The Col de Tentes, Cirque de Troumouse and the Col du Tourmalet all in one day on that little bike, a total ascent of over 10000ft. Coming down is of course great fun. Worst one I think was Mount Ventoux in Provence. That last bit we were down to about 12 mph flat out. Looks identical to Stelvio, and I don't remember them being that similar, but is hard to tell some apart sometimes. 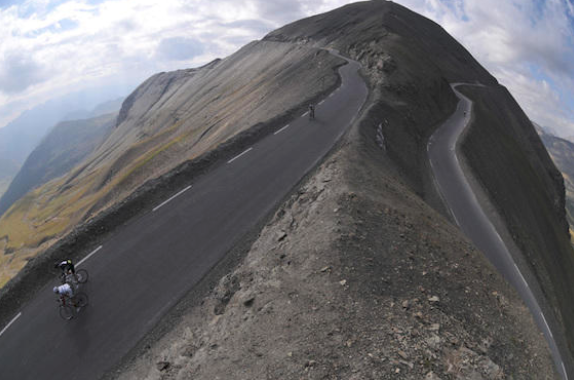 I'd put a fiver on that pic being Stelvio. Did you take the pic, or just nabbed it from the site. I think that cyclist site is getting their pictures of mountain passes mixed up. Could be. I just took it from the site in the link above. Both similar I think although the Stelvio is a bit higher. The Col de La Bonnette in the south western French Alps is another good one. That is higher than both. In fact I think its the highest paved road in Europe. Its ok as well in a motorhome but the last bit is a bit scary as the road splits. You go up on one side of the mountain and back down on the other before they merge again. If you dont realise that the last bit is a bit of an arse clincher as it gets quite narrow and its a long way down. This photo has been taken with an action camera so it makes it look more severe than it is. My brakes nearly set on fire on the way down off that one even though I came down it mainly in second and sometimes first. Yes, things have changed. First time I did some of these passes was in a early 70's Merc 206D, 60hp and drum brakes. Slow going up, slower coming down. The old T1 307's still slow, at least discs on front though. Latest van, hardly notices the hill's.